A little clearing up of plants and replanting on the balcony, which was way past due, was done in the past week. I have since decided to change from using polybags to small plastic pots for the herbs that I grow on the balcony in order to free up some space. Plus it is easier on the eyes, so to speak. 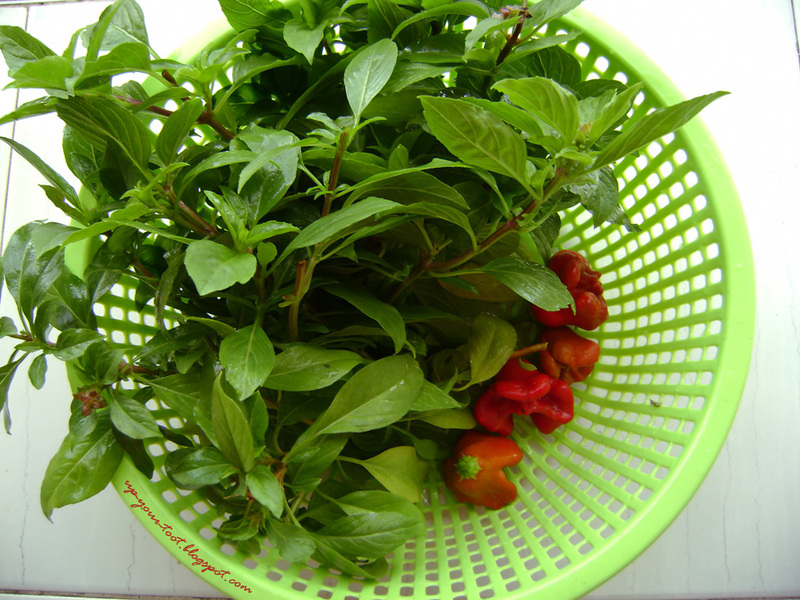 The Thai basil was harvested and made into Thai basil infused vinegar, plus some Bishop’s Crown chillies. The fruits can be two to four-lobed and one plant can produce any of the types, probably influenced by environment factors. A bunch of Thai basil and some Bishop's Crown chillies. The basil went into a jar of vinegar whilst the chilli was used in a salad. 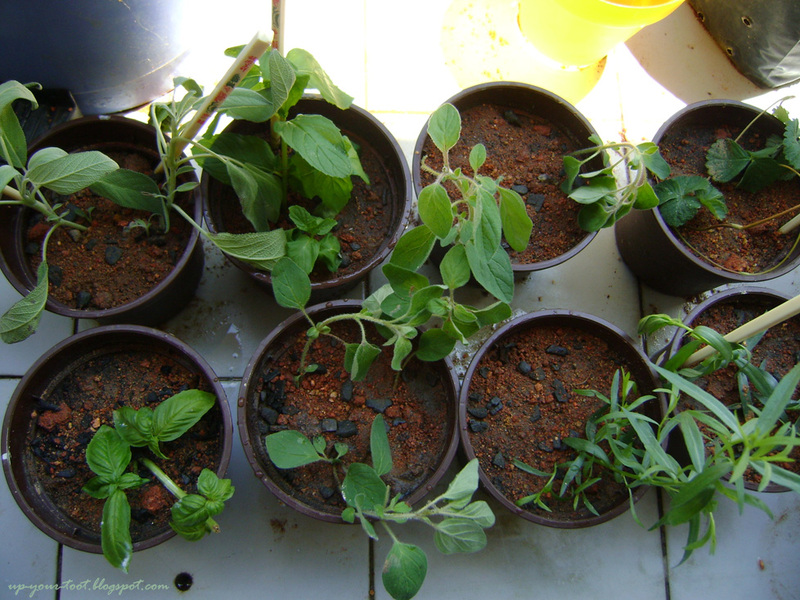 Cuttings of herbs - sage, spearmint, oregano, tarragon and sweet basil. The Capsicum baccatum plant is not doing too well in the heat and having to fend off mealybugs and thrips infestation. Touch wood, I have not seen any spider-mites yet, which is good since they can be very hard to eradicate. Now I am waiting for another batch of Bishop’s Crown seedlings to come up and replace the current plants. The peppermint got evicted from their big polybags and also any other bags that they have managed to crawl to and establish themselves on. They have been reduced to just a few cuttings in two plastics pots. Some of the ripened Bishop's Crown chillies. They can be a 2, 3 or 4-lobed fruit. The lobes are sweet with a mild citrusy taste (I think they taste better than bell peppers) whilst the core is hot. And with enough heat to leave your hands with a burning sensation if you deseed them with your bare hands. 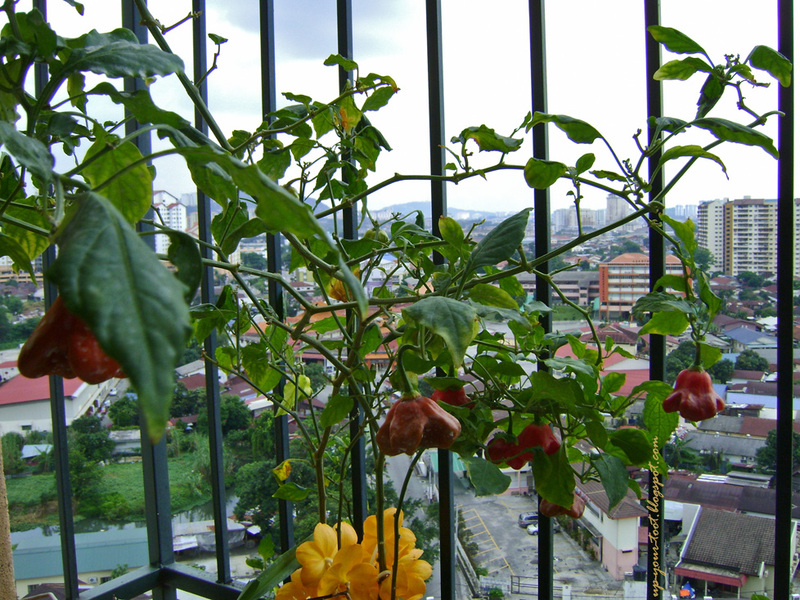 One of the Bishop's Crown Chilli plant on the balcony - I have not harvested this batch of fruits yet. The leaves are not so pretty to look at due to the heat and insect attacks. The Ascocenda Vernon Kebodeaux beneath the chilli blooms like clockwork. Another plant with 7 chillies on a branch that is now almost leafless. They look like mini UFOs hanging from the balcony. I have also sown some of the seeds that Diana gave the last time i.e. the chervil and chives. I have only sown a small number of chervil seeds and will probably continue to sown another batch as I am afraid the conditions here might trigger them to bolt. 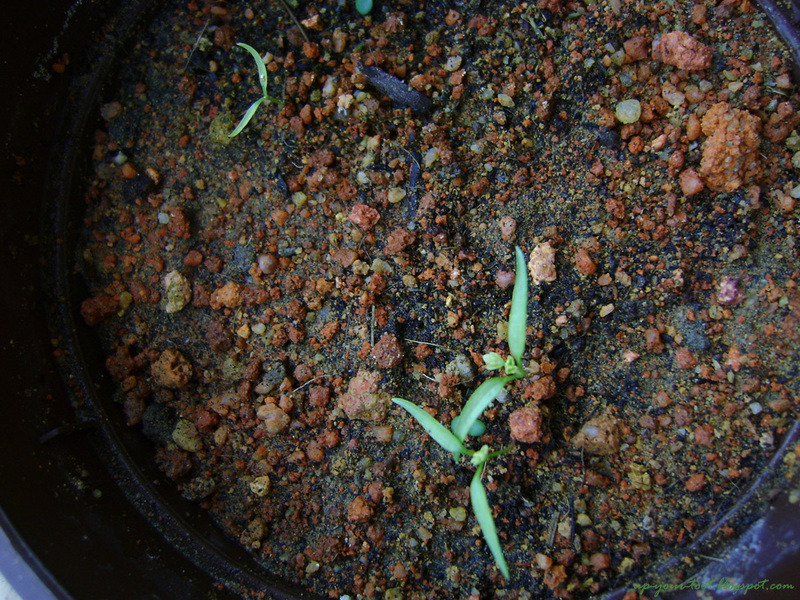 The seedlings seemed to grow at a fast rate, and are all coming up nicely. Took them just 3-4 days to germinate and put out roots before lifting the cotyledon leaves up. If you want some chervil or herb seeds to grow, do check out her blog where those seeds are available (Kebun Bahagia Bersama). Chervil seedlings popping out of the soil. These were from the seeds that Diana sent me last Christmas. 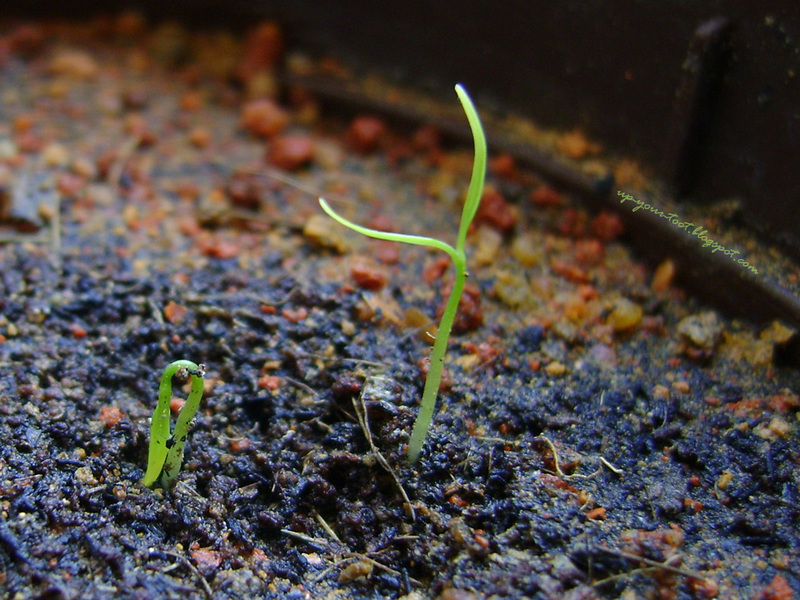 A few days later, the chervil had begun to put forth their first real leaf. Whilst clearing up, I also found out that three of the remaining Dahlia pots had produced pot tubers. I saved two of the three (the third one was a single-petaled type) and repotted the tuber in a small pot. 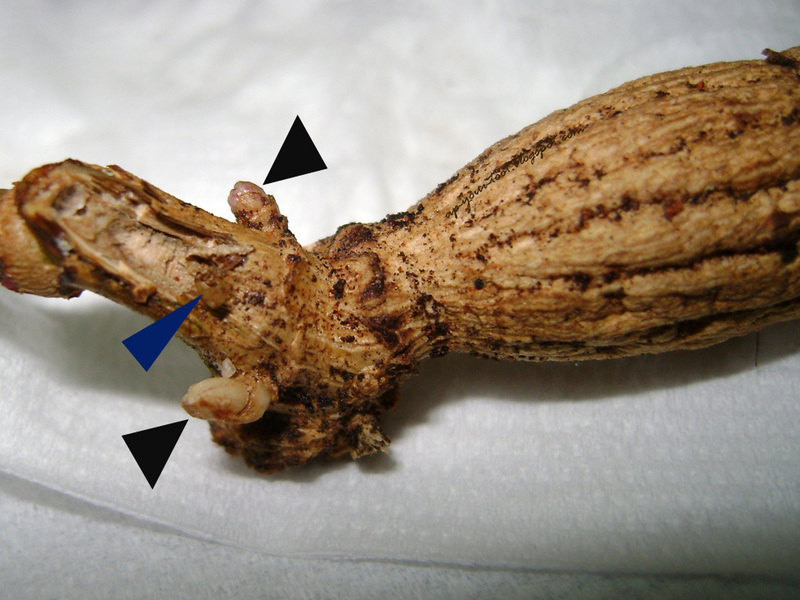 The buds at the neck of the tuber sprouted as well as the lateral buds further up. I did not cure the pot tubers but opted to replant them after soaking the tubers with Carbendazim (Methyl 1H-benzimidazol-2-ylcarbamate) and Zineb (Zinc ethane-1,2-diylbis(dithiocarbamate)). This is to prevent rotting of the cut surfaces on the uncured tubers. I have tried curing Mignon Dahlia pot tubers before and they all shrivelled up as I had allowed it to dry out too much. Pot tubers are much smaller than standard tubers and tend to dry out rapidly once removed from the earth. One of the Dahlia pot tubers - the black arrows point to intact buds at the neck of the tuber whilst the blue arrow is pointing at one that was accidentally damaged by me when emptying the pot. The same tuber after a few days, with the buds sprouting. Since this pot tuber was not cured, the buds on the stem above also sprang forth with life. 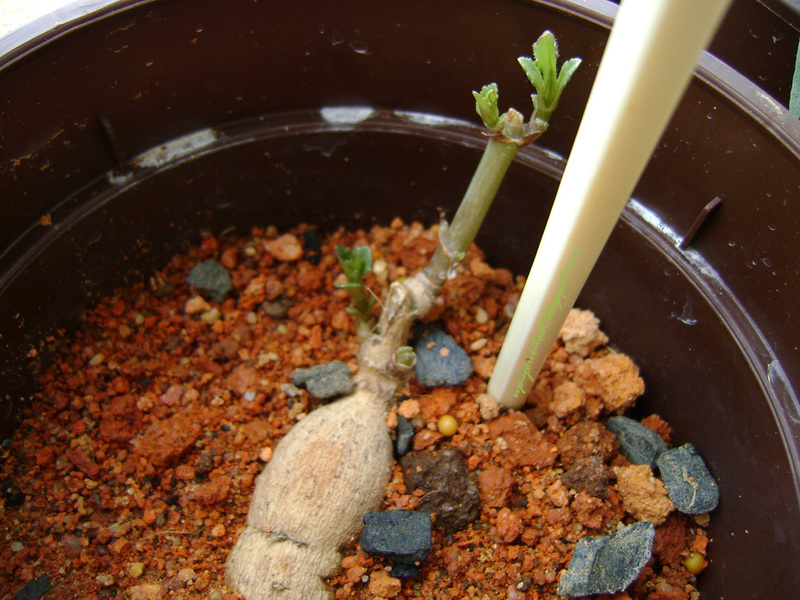 I will slowly raise the soil level to cover the growing buds from the neck of the tuber. And yes, the stake is actually a chopstick. So now I have to be diligent and watch for pest and wait for them to grow back. Where did you buy those soaking chemicals mentioned above? Are you using horticultural carbon in the soil in the last picture? Carbendazim (a benzimidazole fungicide) is from ACE Hardware store whilst Zineb (a zinc thiocarbamate fungicide) is from a nursery in Kajang. The manganese version (Dithane) is available from ACE Hardware as well. I mix both biochar and crushed charcoal of similar size into the mix since biochar is more expensive (Charcoal - 1 big bag is RM8, biochar is a tiny packet for RM7). I prefer Benlate (Benomyl), which will breakdown to the active ingredient, carbendazim but I have no idea where to get them. I used to get Benlate from Fauzi who sells pitcher plants and he gets it from a seller somewhere in KL. Sean, I salute you for your wealth of knowlege! Thanks Autumn Belle, hope the info is helpful. Do you by any chance know where they sell fosetyl aluminium (Aliette in US)? It is a systemic fungicide for controlling Phytophthora or Pythium. Neem oil is good. Where do you get it from? 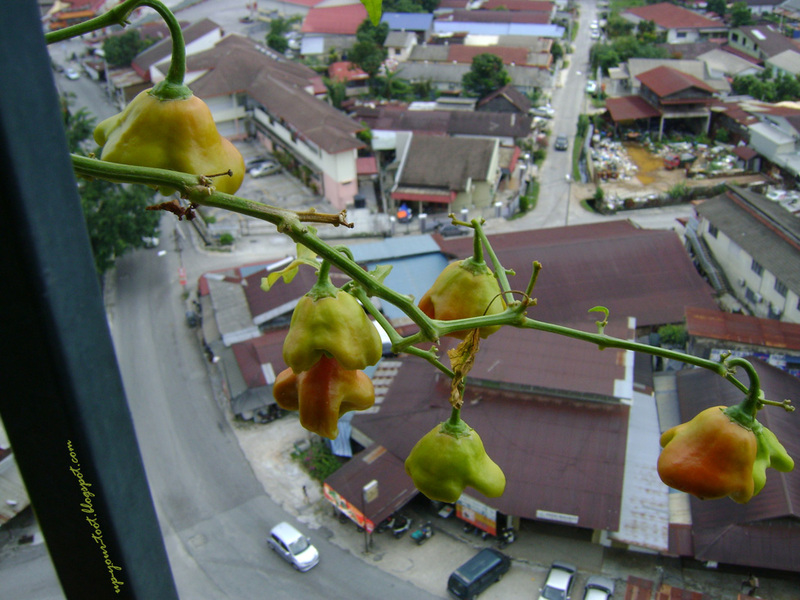 Your bishop's crown look cute poking out from the balcony rail macam jambu air. One of the bloggers in OZ roasted them with cheese fillings I think the other day. The cabbage white butterfly is making appearance now that the weather becomes mild so I need to be a bit diligent with rubbing off eggs from brassicas. I did gave some tree dahlia stems to my mother last year. Only one is growing but very slow and the batang very thin as my cousin reported. Hope your new cuttings will establish soon. Thank you for the link. Have a great week. Hope the tree dahlia at your mum's place grow strong. I can just picture it, your mum's garden with beautiful tree dahlias in full bloom - mesti jiran kecoh. Have a good week ahead. Over here, this week is peppered with holidays. I love your balcony garden high above the city! Once upon a time I too gardened on a balcony, but only on 2nd and 3rd floor ( a duplex) in Ampang. Is the Bishop Crown Chili spicy or sweet? It has an interesting shape. Looks like you have a nice spread for ulam. Thanks. Not much space unlike your garden, but the cooler nights up on the 13th floor helps. 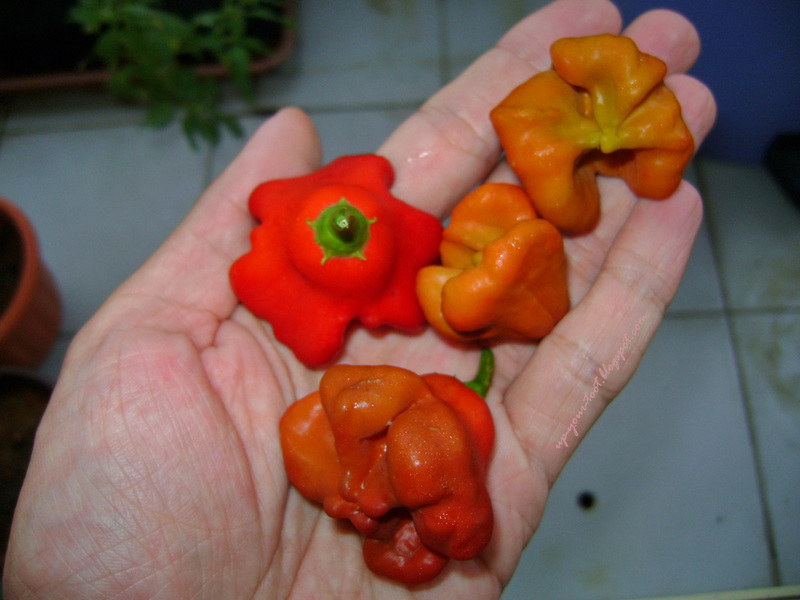 The Bishop's Crown Chili is sweet on the lobes and most parts of the chili but the core can be quite hot. Hopefully all the herbs will grow well.